These rolls do take some time to make but it is worth it and this recipe does make enough so that you could take them to a pot luck or give some away as a friendly gift. The original recipe comes from a 1970s Better Homes and Gardens cookbook, and with a little adjustment, was made suitable for Vaishnava cooking. 1. In a small saucepan combine the milk, sugar, shortening and salt. Heat until warm (ideally to 115 F) and the butter has melted. 2. In a mixer bowl, or just a plain bowl, combine the yeast and just 2 cups of the flour. Once the dry ingredients are combined, add the liquid mix and the 3 tablespoons of yoghurt, and beat well for about three minutes. 3. Begin to add the remaining 1 1/2 - 2 cups of flour, mixing either with your hands or with the dough hook attachment on your mixer until a moderately stiff dough has formed. 4. Turn out of the bowl onto a floured surface and knead by hand until smooth (this may take some time, so be patient). Shape into a ball and place in an oiled bowl. turning once to ensure all dough is oiled. 5. Cover with a tea towel and let rise until doubled in size. About 45 minutes to an hour. Punch down and divide the dough into two equal parts and let rest for another 10 minutes. 1. With a rolling pin, roll each part of the dough into a rectangle approximately 12x8 inches. Brush each rectangle with the melted butter. 2. Combine the 1/2 cup of sugar and the cinnamon powder and sprinkle evenly on each rectangle of dough. Roll up the dough beginning on the long side and seal at the seams. Leave this rest for a minute while you prepare the pecans. 3. Combine in a saucepan the brown sugar, butter and corn syrup and heat on medium heat until butter is melted and the mixture is combined. 4. Divide the mixture evenly between two 9 X 1 1/2 inch round baking pans, making sure it lies evenly in the bottom of the pans, and then sprinkle the pecans on top of the mixture in the pans. 5. Cut the rolls into “snails”, about 1 to 2 inches wide. Each roll should give 12 pieces, but size may vary by how you rolled out and then rolled up your dough. 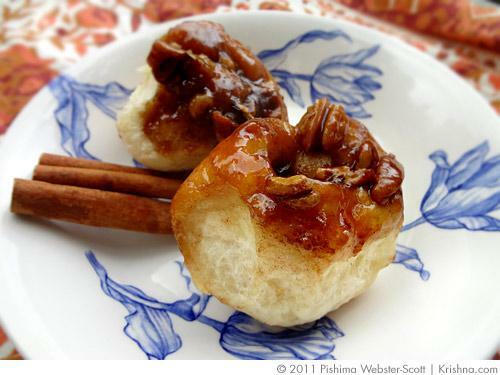 Place the rolls with the cut side down in the pans on top of the pecans and let rise, covered, for about 30 minutes or until double in size. 6. Bake at 375 F for 18 to 20 minutes. Cool for about 30 seconds and then invert on a cooling rack and remove the pans. They are often very hot, so be careful while they cool (and they can be a bit messy too!). These rolls are best eaten the day they are made as they become somewhat harder (although still delicious) the next day. You can reheat them in the oven again, but the nuts tend to get much darker, so be careful.